E.V. McGillick,1 S. Orgeig,1 B.J. Allison,2 K.L. Brain,2 Y. Niu,2 N. Itani,2 K.L. Skeffington,2 A.D. Kane,2 E.A. Herrera,2 D.A. Giussani2 and J.L. Morrison,1 1Sansom Institute for Health Research, University of South Australia, Adelaide, SA 5000, Australia and 2Department of Physiology, Development & Neuroscience, University of Cambridge, Cambridge, UK. Background: Chronic fetal hypoxemia is a common pregnancy complication that is associated with intrauterine growth restriction (IUGR) and respiratory distress syndrome at birth, the extent of which likely depends on the duration, severity and timing of the hypoxic insult. 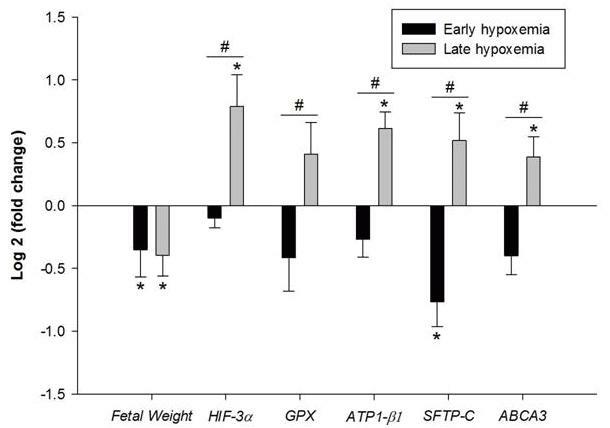 Here, we compared effects on molecular pathways regulating lung maturation following fetal exposure to chronic hypoxemia throughout gestation in the placentally restricted (PR) fetus (early hypoxemia) versus maternal chronic hypoxia (MCH) for the last third of gestation (late hypoxemia). Methods: Control (C, n=11) and PR (n=8; induced by carunclectomy) sheep fetuses were evaluated at 133d gestation (term ∼145d) in cohort 1 (early hypoxemia). In cohort 2, pregnant sheep were exposed to normoxia (N, n=8) or MCH (n=7; 10% O2) from 105-138d gestation and fetuses were studied at 138d (late hypoxemia). Fetal lung expression of genes regulating hypoxia signalling, oxidative stress, lung liquid reabsorption and surfactant maturation were quantified by qRT-PCR. Data are the normalized mRNA expression ratio (Log2 fold change) from respective control for each cohort. Results: Early and late hypoxemia promoted similar IUGR (see Figure). While early hypoxemia decreased the fold change expression of genes regulating surfactant maturation, late hypoxia increased the fold change expression of genes regulating hypoxia signalling, antioxidants, lung liquid reabsorption and surfactant maturation. The figure shows mean fetal weight and mRNA mean normalized expression ratio (Log2 fold change ± SEM) for hypoxia signalling factor HIF-3α, antioxidant GPX, regulator of lung liquid reabsoprtion (ATP1-β1), surfactant protein (SFTP-C) and surfactant lipid transporter (ABCA3) in fetuses exposed to early hypoxemia (placentally restricted fetuses; n=8) and late hypoxemia (fetuses exposed to maternal chronic hypoxia (MCH) for a month in late gestation; n=7) in comparison to respective controls (PR vs C or MCH vs N, *P≤0.05). Positive or negative mean values indicate induction or repression of gene expression respectively (PR vs MCH, #P≤0.05). Conclusion: We provide evidence for the heterogeneity in respiratory outcome in IUGR infants following exposure to hypoxemia in utero dependent on the timing and duration of the insult. Supported by the British Heart Foundation (DAG) & NHMRC of Australia (JLM & SO).